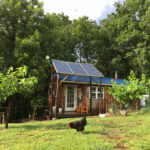 Tiny houses have emerged as an extremely popular alternative to modern “McMansions,” and as a way to create shelter that is affordable, sometimes portable, and eco-friendly. We have spent the last two years building our 350 square foot home. And while I’ll be the first to tout the benefits of going tiny, I’ll also admit this: We never set out to build a tiny house. 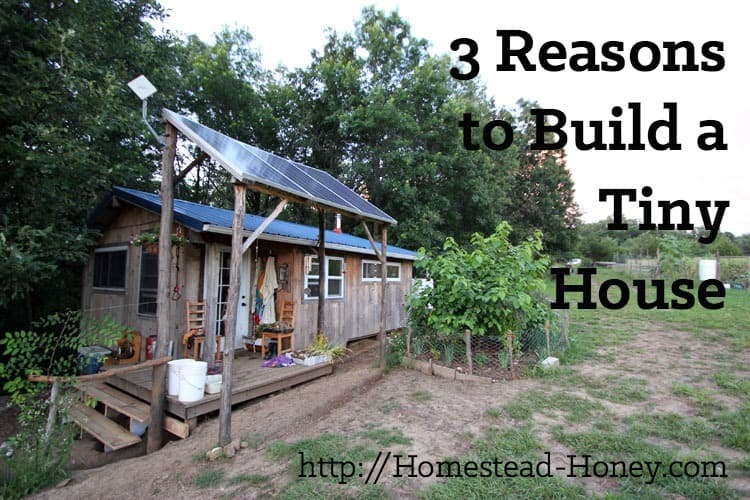 Even so, it was a great decision for our family, and in this post, I will share with you my top three reasons to build a tiny house. When we moved to NE Missouri in 2011, one of the aspects of living in this rural community that most excited us was the opportunity to build our own home, in a county that has very relaxed owner-building codes. 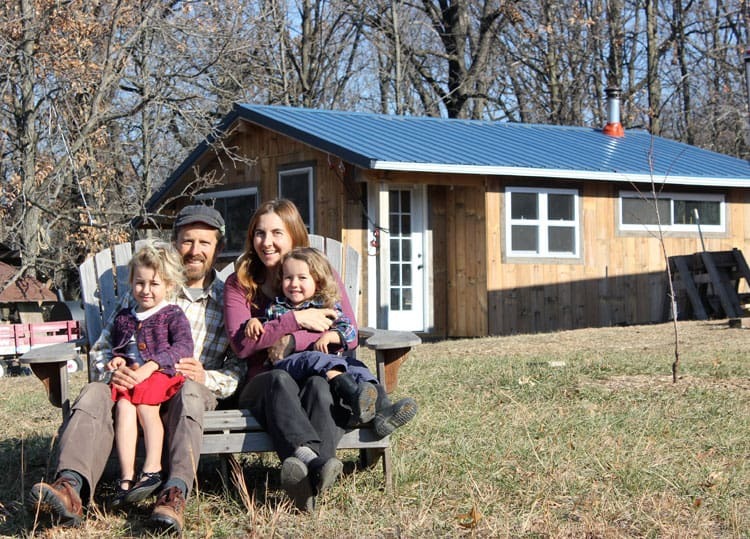 For years we have dreamed about building a timber framed strawbale house and were inspired by the many alternative structures in NE Missouri (see this post for inspiration!). However, the reality of building a large timber framed building is that it takes a long time. For instance, our neighbors Mike and Julia have been working on their round wood timber frame home for three summers. They have done a lot of work by hand, but have also used power tools and a generator when necessary. Our neighbors to the south have been working on their duplex strawbale home since we first visited in October of 2010. While they are using only hand tools, they have also benefitted from workshops and interns helping their project along. For a family with two small children and only one skilled builder (not me! ), the idea of jumping right into building our dream home was daunting, at best. Besides, where would we live while the building happened? Our initial plan was to construct a three season shelter that would act as a screened sleeping area and covered outdoor kitchen. The idea was that we would live in this shelter while we built our dream home. 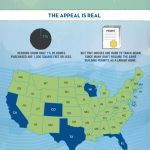 But we very quickly realized that we would have to rent a living space elsewhere, and the idea of moving OFF of our land when we had just arrived made us reconsider. We decided to turn the footprint of the three season shelter into a fully insulated tiny house. 1) The building is human-scale. For almost all aspects of building, my husband has been able to work alone, or with one other person, using only small power tools. No cranes, no heavy machinery, no waiting for a crew to come together. 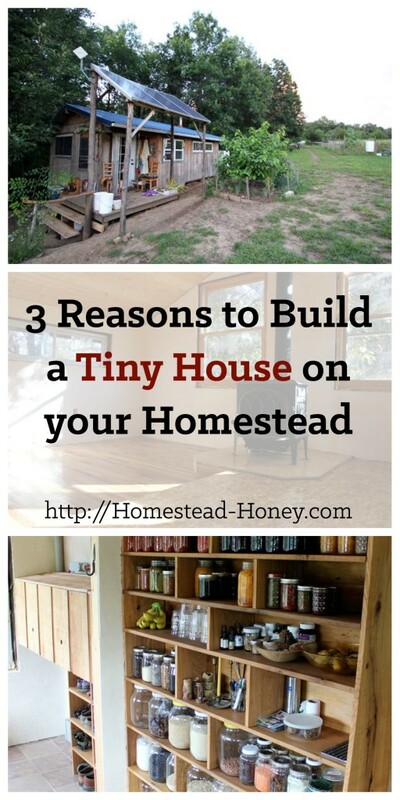 2) A tiny house can be built quickly. We broke ground on our home in February of 2013, and were moved into an insulated house by the end of October of the same year. Granted, there were still many details to finish, such as flooring and wall plaster, but we were warm, sheltered, and most importantly, we were not paying rent elsewhere. 3) Tiny houses can be extremely affordable, as the amount of materials needed to construct the house is, well, tiny. 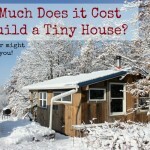 For a full comparison of the expense of building our 350 square foot home and our neighbor Beth’s 120 square foot home, see this blog post. Honestly, we see an addition in our future, as 350 square feet would probably be quite perfect for a couple, but a bit small for a family with two growing children, ages 4 and 7. We hope to begin work on a timber framed strawbale addition in the next year or two. We just recently installed our solar electric system, and will continue to work on finish details such as window trim, shelving, and a built-in booth seating area. But for now, our tiny home is a cozy, warm, gorgeously detailed space in which to live and dream. 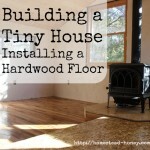 If you’d like to read more about building a tiny house, this category is chock full of information! Would you ever live in a tiny house? 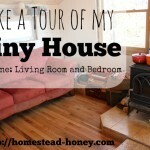 How tiny is too tiny for your family? Hi! I am inspired by your website but I am wondering where you store everything? Our canned goods, beekeeping equipment, woodworking tools, sewing materials, garden tools, etc. take up a lot of room. My husband and I joke that we could have a small 800 square foot home but need a a basement or shed for storage. A root cellar would be great but it has to be carefully planned for moisture control so canning lids don’t rust etc. Ah, this is the biggest challenge of a small house! Honestly, it’s why I think a house of this size is not really doable for our family. 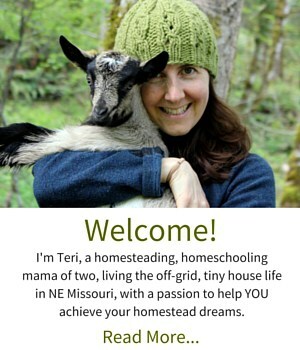 I”m okay with being in a small space with everyone, but when you consider that we homestead, homeschool and work from home, we really do not have enough space. For now, we have a very packed storage shed (see this blog post: https://homestead-honey.com/2014/07/17/homestead-shed/ Our ultimate plan would be to add on a small addition – just enough for a kitchen/living room and maybe a bedroom loft for the kids. Hope you don’t mine if I chime in, but we too are doing a 10×10 shed for storage. It’s very inspiring as I watch your progress! Your small home is beautiful. I love the addition of the solar panels. I’m hoping we can do that soon. We actually live on 32 acres in rural central Oklahoma and have since 1998. We are hooked to the electric company at this point, but I would love to be free of utility payments. I think solar panels are the way to go. Although our home isn’t tiny, we live in 1850 square feet of a double wide Solitaire home that we bought used and had moved out to the land we bought in 1998, I have decided if for any reason we move or had to build or rebuild on our land – we would definitely build smaller. Thank you for allowing us to see your progress and being honest about your plans and how you began. It’s refreshing to see so many young people choosing a more simple lifestyle. Thanks so much for your comment. It’s really sweet. I LOVE your blog..such an inspiration. We are a family of 7 (although one is in college) preparing to move into a 576 sq. 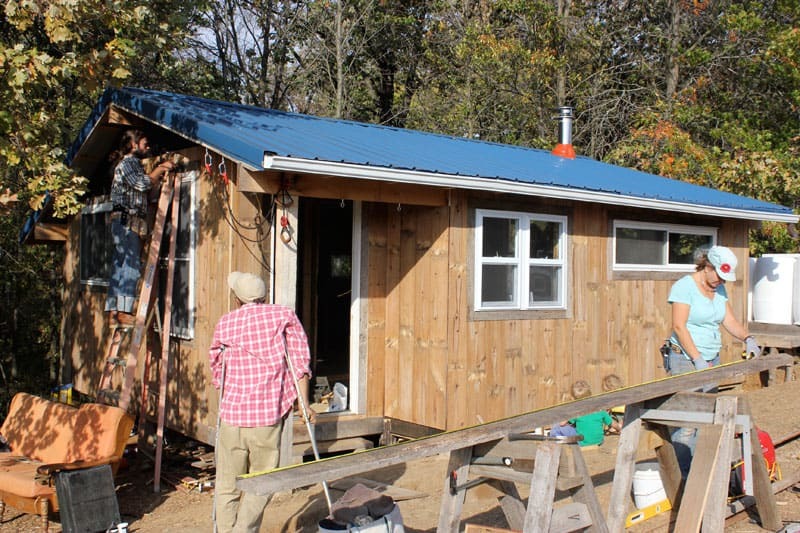 Ft. Cabin we built on 7 acres….planning to incorporate permaculture, etc. We currently live in 1400 sq ft. On 5 acres. I just wish we had the community you seem too have. Please keep the posts coming! Wow, your home makes ours feel spacious! Can I ask how you’re working the bedroom situation out? We’re in one giant bed right now, but would love to have the freedom to give the kids (and us) a bit more space. I do feel fortunate that we have community here, and aside from the affordable land, it’s the top reason we moved to this specific location – we already had friends living on the same road as we do. Youre funny;)… cabin is 12×24..two floors. The 4 kids will be upstairs..were doing a futon down. I have a friend who has (soon to be 4 children in a 350 sq.ft. off grid. The kids in a loft and they have a built in bed down just curtained off:) One of my favorite photos on your blog is the one of your kitchen. It helped me to relax a little and know that these things take TIME!! If we had done this again, I think we would have built a two story, or at least a loft. Although I do love our high ceiling! Oh..that green grass, I keep thinking how we should have done a vaulted ceiling for these long Ohio winter days to give some “breathing” room..lol. I just don’t often show the **really** unfinished and messy corners of the house. But they’re there! So nice of you to be honest:)…really! Our family of four lived in a fifth wheel RV with 5 slides when our kids were 16 & 17. We found we didn’t use a good portion of what we thought we needed. We had two separate bedrooms and two baths in addition to a large living area and kitchen. We utilized the space outside more. The lack of privacy forced an intimacy and team mentality. It made us a stronger family. Downside was we put on a lot of weight! 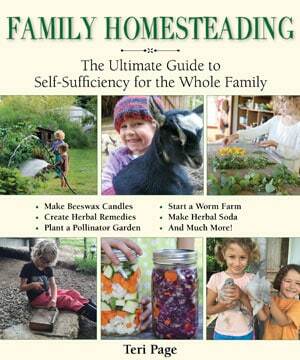 We weren’t living on a homestead and had no yard work chores. We were just learning to cook from scratch so we still utilized convenience foods. There were no stairs to climb in our home any longer. We ballooned to unhealthy proportions. We’ve decided to build 1,080 sq ft. The kids are moving out next year so that’s just for us. YEs, I think one of the benefits of a small house is that you HAVE to figure out ways to get along and solve conflict. You can’t just retreat to your own space and ignore issues. I never really thought about the physicality that might come from living in a larger house, but definitely, you don’t move around much in a tiny house! Looks like a good way to get to know your land, get to know your construction partners, get established fast and maybe have a place to live while you create better digs. Enjoy! Glad you found my blog, Erin!